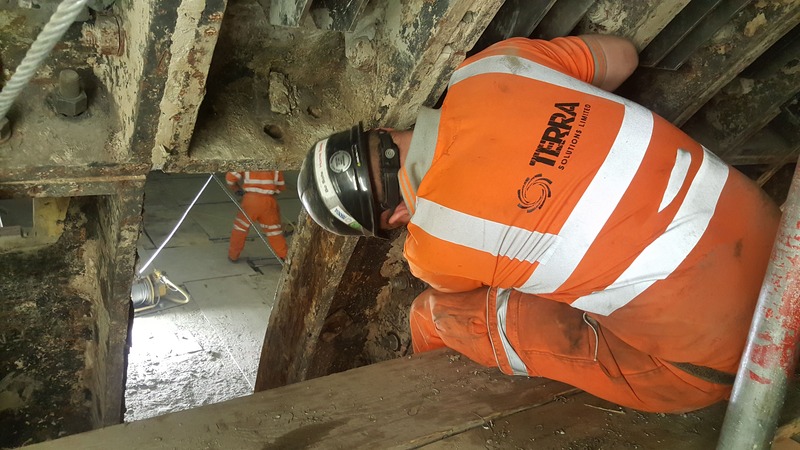 When tasked with creating new entrances to a historic Tube station in central London, Terra Solutions faced some of the toughest technical challenges possible for a trenchless install. In developing the new Bloomberg place, and to reduce peak period congestion on the Waterloo and City Line at Bank Station, complex subterrestrial works had to be executed to upgrade, expand and develop the station and its connection corridors. The commuter connection to the new Bank Bloomberg station required the construction of two passenger tunnels which linked the new Bloomberg Building to the ‘live’ Waterloo & City Line of Bank Station. Bank station serves five major Tube lines, as well as the Docklands Light Railway, making it one of the busiest stations on the London Underground network. As well as these transport systems, central London also has one of the most densely populated subterranean infrastructure networks in the world. Located in a conservation area, surrounded by Grade 1 Listed Buildings (including St Stephen’s Church, Walbrook and The Mansion House), and above an ancient Roman Mithraeum the local geography presented many sensitive receptors. However, the most significant factor was the many passengers within the underground during the sensitive tunnelling works. The original planned construction technique was Sprayed Concrete Lining (SCL), however Terra Solutions were forced to reassess the viability of this technique when differing ground conditions were reported in previous unseen piling logs at the early contractor involvement stage. Terra identified that SCL would not be applicable in this instance due to a band of gravels which was significantly shallower than previous site investigation indicated. A different tunnelling method was recommended to the client i.e. Square Works Tunnelling. Two passageway adits were necessary were to be constructed perpendicular to the existing corridor, allowing for access to the existing station and network from the new development. The finished clear opening dimensions of the two adits were to be 2400mm x 3324mm and 2400mm x 2646mm. As the superstructure was being constructed concurrently with the adits, the only access to the works location was through two material hoists further complicated with size and weight restrictions. The chosen Square Works technique, which incorporates timber heading construction, was employed to temporarily support the ground while excavation works were carried out. The permanent works concrete was then cast inside the temporary square works supports which enabled breakthrough to the existing station. After exhaustive planning, work could commence. The first task was to remove the concrete soft eye of the basement structure in stages. Test coring discovered the soft eye to be on average 800mm thick, instead of the 500mm originally indicated, meaning that saw cutting was no longer a viable option. 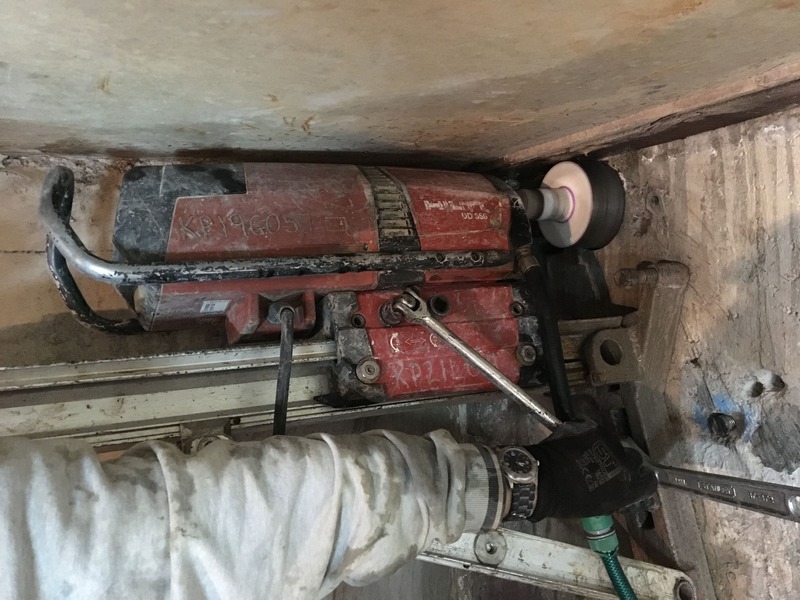 Terra Solutions switched to stitch drilling the entire soft eye into 1m x 1m blocks using Hilti DD-350 coring rigs and 127mm ø cores. Once each section was fully cored, 6nr. 48mm bursting holes were cored and the Darda hydraulic concrete burster used to break the concrete. The concrete was broken down further, using the Hauser H11German Jiggers and removed by hand. The exposed ground behind the soft eye was boarded, using C24 graded 9” x 4” timber, and grouted immediately. The same process was repeated until the whole of the concrete soft eye was removed with steel whalers installed across the boards to hold them in position. The next stage required excavation towards the extrados of the existing tunnel segments of the Waterloo & City Line. As progress was made, both side and top frames were installed. 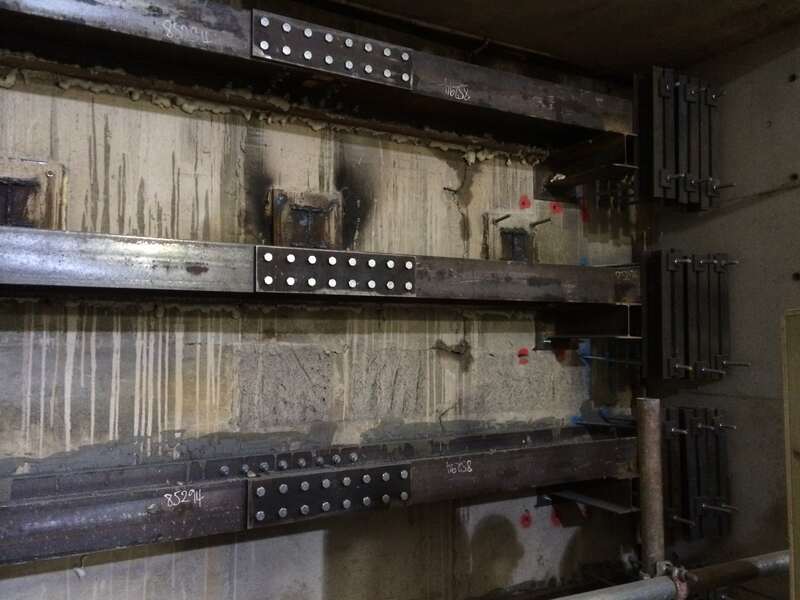 The adits were tunnelled in four main elements with the soffit, left wall, right wall and base all being sequenced to maintain ground support and integrity of the existing underground tunnel. Significant steel beams were installed in the soffit to support the overburden and bespoke steel lintels were fixed to the existing tunnel lining to support the tunnel prior to creating the opening. All the steel work was cast in the permanent works concrete along with waterproofing (Re-injectable grout Tubing & Water Bar) & reinforcement. Bespoke shuttering designs were required for each of the pours all of which provided no access for compaction, therefore a ‘self-compacting’ concrete mix was adopted. Ready-mix concrete lorries delivered the concrete to an access point on the street which was then fed into a static concrete pump line than delivered the concrete down 5 storeys over a distance of approximately 200m to the adit locations. 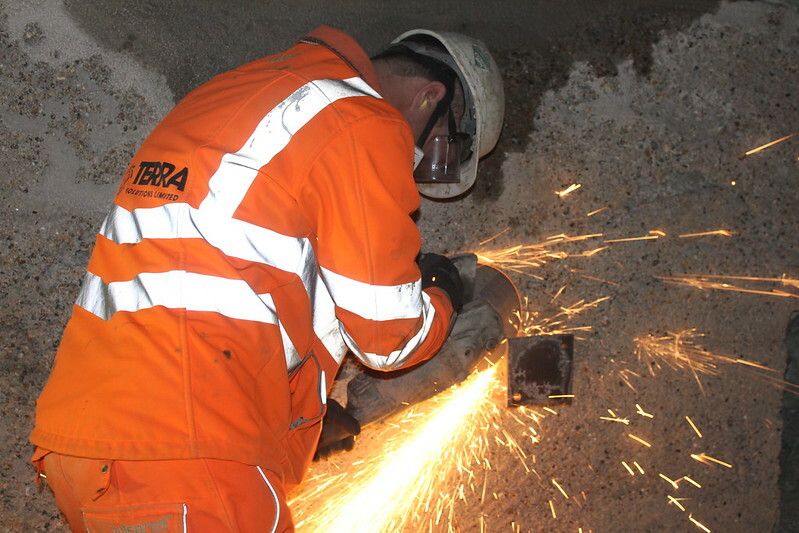 Once all the permanent works concrete was properly cured, removal of the existing tunnel segments could begin utilising a system of lifting points, winches & pulley systems all designed and set in a highly confined space. Each cast iron tunnel segment was unbolted and removed individually and protruding edges saw cut back flush to the permanent works concrete. The project came upon, & overcame, some significant challenges including encountering a buried 120 year old tunnel shield & unrecorded piles, amongst others. Efficient & expedient cooperation with the designers & London Underground Limited (LUL) resulted in specialised unique construction applications to surmount such obstacles whilst maintaining the integrity of the tunnel. 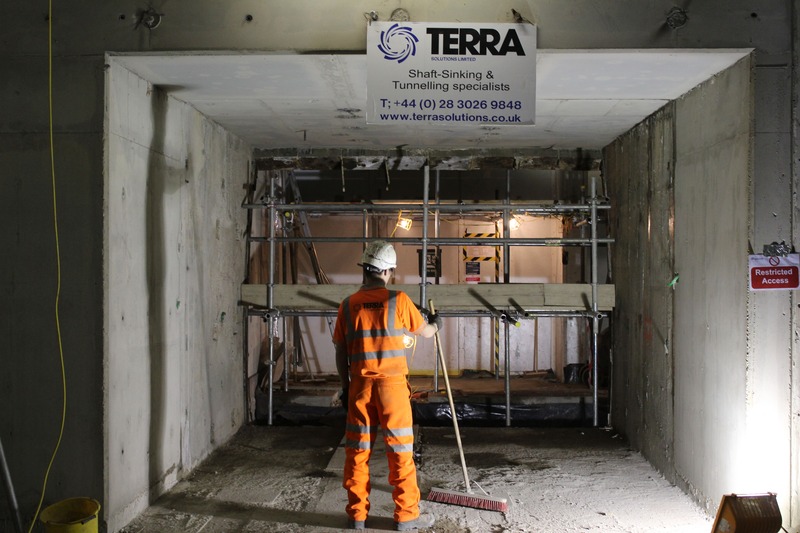 Terra Solutions successfully completed the Project in challenging, and very confined conditions, to the client’s satisfaction, delivering high level LUL specifications in an unpredictable environment that often required complex engineering circumvention. A tremendous technical challenge, executed by subterranean experts. Find our other Adit Construction projects here.